Background: The aim of this study was to assess the accuracy of high-resolution ultrasonography (USG) in the evaluation of rotator cuff tendinopathies and tears with magnetic resonance imaging (MRI) correlation to determine its sensitivity and specificity. Materials and Methods: The prospective study was conducted on 40 patients referred to the Department of Radiology for the evaluation of rotator cuff pathologies over a period of 18 months. All the patients underwent high-frequency USG followed by MRI. Variables such as sensitivity, specificity, negative predictive value (NPV), positive predictive value (PPV), and accuracy of high-frequency USG and MRI were evaluated. Results: The sensitivity, specificity, NPV, PPV, and accuracy of high-frequency USG in the evaluation of rotator cuff pathologies in comparison to MRI as standard were 90.6%, 87.5%, 96.6%, 70%, and 90%, respectively. Conclusion: High-frequency USG is almost equally sensitive and specific as MRI for the diagnosis of rotator cuff pathologies, and due to its cost-effectiveness, easy affordability, ease of evaluating contralateral shoulder, more patient compliance, noninvasiveness, and wider applications, we recommend it to be used as a primary modality for evaluating rotator cuff. MRI should be performed in case some extra information is required. The shoulder joint is an elegant anatomic structure held in place by a complex arrangement of muscles, tendons, and ligaments. Rotator cuff is a continuous structure around the shoulder comprised four tendons – subscapularis, supraspinatus, infraspinatus, and teres minor tendons; the long head of the biceps tendon also contributes to the cuff. The requisites for normal cuff functioning are strong, healthy, intact cuff muscles and tendons, normal capsular laxity, and smooth coracoacromial arch. Intrinsic causes lead to degenerative changes in the substance of the rotator cuff with increasing age. The degeneration may result from relative ischemia in the distal portion of the tendon near its insertion site on the humerus. Rotator cuff degeneration may incite secondary proliferative bony changes on the under surface of acromion. Extrinsic cause of rotator cuff disease relates to the mechanical impingement by surrounding structures. The impingement can lead to inflammatory and degenerative changes in the underlying tendons. Rotator cuff tears can be full-thickness tear (FTT) or partial-thickness tear (PTT). A FTT is a defect that allows communication between the subacromial-subdeltoid (SASD) bursa and the glenohumeral joint. PTTs are so called because they involve only either substance or surface of the tendon. Joint surface partial tears are more common than bursal surface partial tears. Shoulder pain is a significant cause of morbidity, the prevalence of self-reported pain is estimated to be between 16% and 26%, and it is the third most common cause of musculoskeletal consultation in primary care. A thorough understanding of the anatomy and function of the rotator cuff and the consequences of rotator cuff disorders is essential for optimal treatment, planning, and prognostic accuracy. Identifying the disorder, understanding the potential clinical consequences, and reporting all relevant findings at rotator cuff imaging are also essential. Both ultrasonography [USG] and magnetic resonance imaging (MRI), being two competing noninvasive techniques, are currently touted for evaluating rotator cuff pathologies and essentially obviating conventional arthrography. Technical improvements, coupled with advances in the understanding of anatomic and pathologic characteristic of the rotator cuff, have resulted in the maturation of these two modalities. Both techniques have their advantages and disadvantages and can be competitive and complementary at the same time. At present, MRI is the preferred choice for the evaluation of rotator cuff fatty infiltration and muscle atrophy in clinical practice. However, it is expensive and time-consuming. The accuracy of these imaging tests is considered to have improved significantly over time, enabling useful assessment of the size and extent of the rotator cuff tear when planning surgery. Various authors have suggested that US is as accurate as MRI for both FTTs and PTTs. These results, combined with the lower cost of US, suggest that US may be the most cost-effective imaging method for screening of rotator cuff tears provided that the examiner has been properly trained in this operator-dependent technique. Moreover, MRI should be used secondarily because it provides more information about extent of tendons and has lower risk of artifacts. To determine the diagnostic accuracy of high-resolution USG for assessing the biceps tendon pathologies in people with rotator cuff tears and tendinopathy. The study was conducted over a period of 18 months in the Department of Radiology. The study was approved by the Institutional Ethical and Scientific Committee. The prospective study was carried out on 40 patients with clinically suspected rotator cuff pathology referred from the departments of orthopedics and physical medicine and rehabilitation over a period of 18 months. Patients aged ≥20 years of either gender who presented with pain in shoulders and were clinically suspected to have rotator cuff pathology, both acute and chronic, were included in the study. All the ancillary investigations such as shoulder X-ray (anteroposterior view) were done as and when required. The sonography was performed with Siemens Aloka equipped with a phased array linear 7–11 MHz transducer. The US examination was done according to the American Institute of US in Medicine Practice Guidelines (2007) for the Performance of the Musculoskeletal US Examination. Patients were examined in the sitting position, on a rotating seat. The biceps tendon was examined with the forearm in supination and resting on the thigh or with the arm in slight external rotation. The tendon was examined in a transverse plane (short axis), where it emerges from under the acromion to the musculotendinous junction distally. Longitudinal views (long axis) were also obtained. These views were used to determine if the tendon is properly positioned within the bicipital groove, subluxated, dislocated, or torn. To examine the subscapularis tendon, the elbow remained at the side while the arm was placed in external rotation. Both transverse (long-axis) and sagittal (short-axis) views were obtained. Dynamic evaluation as the patient moved the arm from internal to external rotation was also done. To examine the supraspinatus tendon, the arm was extended posteriorly, and the palmar aspect of the hand was placed against the superior aspect of the iliac wing with the elbow flexed and directed toward midline (patient was instructed to place the hand in the back pocket). To scan the supraspinatus and infraspinatus tendons along their long axis, the transducer was oriented approximately 45° between the sagittal and coronal planes to obtain a longitudinal view. The transducer was then moved anteriorly and posteriorly to completely visualize the tendons. Transverse views of the tendons were obtained by rotating the probe 90° to the long axis. The tendons were visualized by sweeping medially to the acromion and laterally to their insertions on the greater tuberosity. The more posterior aspect of the infraspinatus and teres minor tendons was examined by placing the transducer at the level of the glenohumeral joint below the scapular spine while the forearm rested on the thigh with the hand supinated. Internal and external rotation of the arm was helpful in identifying the infraspinatus muscle and its tendon and in detecting small joint effusions. To visualize the teres minor tendon, the probe was angled slightly inferiorly. Throughout the examination of the rotator cuff, the cuff was compressed to detect nonretracted tears. In the evaluation of rotator cuff tears, comparison with the contralateral side was done. While examining the rotator cuff, attention was also paid to evaluate for bursal thickening, effusion, loose bodies, tendon calcification, and muscle and bony abnormalities. If symptoms warranted, the acromioclavicular joint, the supraspinatus notch, and the spinoglenoid notch were also evaluated. USG criteria for the diagnosis of rotator cuff tears include direct and indirect signs. A field of view of 16 cm and the slice thickness of 4 mm were used. MRI findings were classified into intact cuff, partial-thickness and full-thickness rotator cuff tears, and tendinopathies. Established criteria were used for the diagnosis of a partial-thickness or full-thickness rotator cuff tears. Biceps tendon involvement and other associated abnormalities were noted. There were 22 males and 18 females, with a ratio of 1.2:1. Statistically, no difference was found in the prevalence of shoulder pain in relation to gender. Distribution of patients with shoulder pain as per age group was 8 (20%) patients in 20–40 years of age group, 14 (35%) patients in 41–60 years of age group, and 18 (45%) patients in the age group of ≥61 years. The prevalence of shoulder pain increases with the increasing age. The highest number of patients was in the age group of ≥61 years (45%). Eleven (27.5%) patients had a history of trauma. Two (5%) patients were in 20–40 years of age group, 4 (10%) patients were in 41–60 years of age group, and 5 (12.5%) patients were in the age group of ≥ 60 years. The number of patients with right shoulder pain was 32 (80%) and left shoulder pain was 8 (20%). There was statistically significant difference between the prevalence of cuff tear in the dominant and nondominant arms. Out of 25 right-handed patients, 23 patients had rotator cuff pathology involving the right shoulder and two had pathology involving the left shoulder. Out of seven patients who were left handed, five patients had rotator cuff pathology of left shoulder while two patients had right shoulder cuff pathology. It suggests that the dominant arm is more prone to wearing effects and thus tear/tendinopathy. Out of 40 patients, 14 patients showed FTTs, nine patients had PTTs, seven patients had tendinopathy, and 10 patients were normal. The agreement between the USG and MRI was done using kappa coefficient and the agreement was found to be good (kappa = 0.714). The strength of agreement between USG and MRI for the diagnosis of rotator cuff tears and tendinopathy is considered to be “good.” Out of 30 patients with cuff lesions on USG, 14 patients showed FTTs and one patient with MRI-proven PTT was falsely diagnosed as having FTT. USG also showed nine PTTs, out of which one had FTT and one had tendinopathy on MRI. Three patients with MRI-proven lesions were falsely diagnosed as normal. Out of seven patients with tendinopathy, one was normal, one had FTT, and two had PTT on MRI. USG detected 29 true-positive lesions, three false-negative lesions, and one false-positive lesion while seven patients were diagnosed as normal (true negatives). When MRI was conducted on these patients, 32 patients had rotator cuff lesions while eight patients were normal. Out of these 32 patients, 15 patients showed FTTs, 10 patients showed PTTs, and seven had tendinopathy. Statistical evaluation of USG for the detection of rotator cuff tears and tendinopathy compared with MRI was done. Sensitivity, specificity, and positive and negative predictive values (PPV and NPV) were calculated according to accepted formulae. [Table 1], [Table 2], [Table 3], [Table 4], [Table 5], [Table 6], [Table 7], [Table 8], [Table 9], [Table 10], [Table 11] show the frequency of various abnormalities seen on USG and MRI with the correlation between two including the statistical figures. [Figure 1], [Figure 2], [Figure 3], [Figure 4], [Figure 5], [Figure 6], [Figure 7] show the comparative (USG and MRIs) of various rotator cuff tendinopathies seen in the present study. One of the most common causes of shoulder pain is rotator cuff disease. It is the third most prevalent musculoskeletal disorder after low back and neck pain. Shoulder pain is usually due to one of several causes: subacromial impingement and bursopathy, tendinopathy, a tendon tear, a frozen shoulder, ligamentous instability, and osteoarthritis. This study was based on the evaluation of rotator cuff tendinopathies and tears with high-resolution USG and MRI correlation. The present study found no statistical difference in the prevalence of rotator cuff tear or tendinopathy in each gender, which correlates to the study conducted by Milgrom et al. The ages of all the cases ranged from 20 to 70 years (mean age 45 years). History of trauma was more often seen in elderly patients. It was found that massive tears affect elderly population more frequently. Out of 25 patients who were right handed, 23 patients had rotator cuff pathology involving the right shoulder and two had pathology involving the left shoulder. It suggests that dominant arm is more susceptible to wearing effects, leading to rotator cuff tears and tendinopathy. Similar results were obtained by Moosmayer et al., who studied 100 subjects with full-thickness rotator cuff tears and found that RCT was more common in the dominant arm. US examination of the contralateral shoulder was done in each for comparison. Rutten et al. recommended comparison with the contralateral shoulder as additional support for avoiding misinterpretation of normal anatomic differences as tears. Out of 40 patients, 14 patients showed FTTs, nine patients were diagnosed as having PTT, seven patients showed tendinopathy, and 10 patients were normal on USG. Thus, USG showed a total of 30 patients with rotator cuff pathologies. Rotator cuff tears were diagnosed on US as per the direct and indirect signs. The direct signs were full-thickness discontinuity or nonvisualization of the tendon (FTT) and focal thinning or focal hypoechoic defect involving surface or substance of the tendon (PTT). Tendinopathy was diagnosed as bulky heterogeneous tendon or diffuse thinning or calcifications of the tendon. Out of 14 patients with FTTs, eight patients had full-thickness discontinuity and six patients showed nonvisualization of the tendon. Out of nine patients with partial tears, seven patients showed a hypoechoic defect involving substance or surface (articular or bursal) of the tendon and two patients demonstrated focal thinning of the tendon. The articular surface tears were the most common type of PTTs, seen in four patients. Similar results were reported by Rutten et al., who found hypoechoic defect and focal thinning of the tendon as markers of PTT. Because of the difficulty in diagnosing some rotator cuff tears with USG, certain indirect signs have been described. These indirect signs in our study were concavity of the subdeltoid bursal fat or loss of the convexity of the outer border of the rotator cuff, cortical irregularity, cartilage interface sign, fluid in the SASD bursa, and fluid in the long head of biceps tendon sheath. We found cortical irregularity as an important secondary sign, seen in 10 out of 14 (71.4%) and 6 out of 9 (66.6%) patients with FTT and PTT, respectively. It is comparable to the study carried by Churchill et al. Another important indirect sign was intrasynovial fluid which may be seen either in the SASD bursa or in biceps tendon sheath. This fluid is provoked by irritation and impingement of the entire rotator cuff. 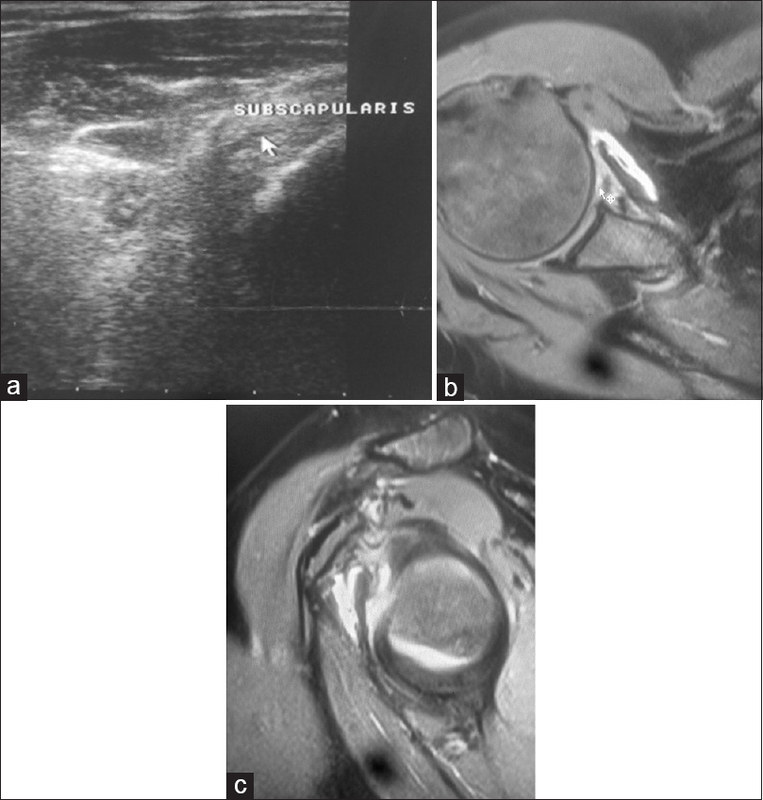 On MRI, SASD bursal fluid was seen in a total of 13 (32.5%) patients, and all of them had either full- or partial-thickness rotator cuff tears or tendinopathies on USG. Out of these 13 patients, SASD bursal fluid was seen in eight out of 14 (57.1%) patients with FTTs, three out of 9 (33.3%) patients with PTTs, and two out of seven patients with tendinopathy. Similar results were reported by Beall et al., who reported that the presence of intra-articular fluid in combination with SASD bursal fluid on US was highly specific and had a high PPV for rotator cuff tears. When MRI examination was conducted in all these 40 patients, it showed a total of 32 rotator cuff lesions while eight patients were diagnosed as normal. Out of 32 patients diagnosed with rotator cuff pathologies on MRI, 15 showed FTTs while 10 showed PTTs and seven showed tendinopathy. On MRI, visualization of altered signal intensity in the tendon extending from the articular to the bursal surface of the tendon was seen in 10 (66.6%) patients and nonvisualization of the rotator cuff tendon was seen in 5 (33.4%) patients, respectively, out of 15 patients having FTTs of the rotator cuff. Focal area of mildly increased signal intensity on Proton Dense (PD) images which increased in signal intensity on T2-weighted images and extended to one surface only or was seen within the tendon substance itself was seen in 8 out of 10 PTT (75%) patients. These patients were diagnosed as having partial thickness rotator cuff tears. Among these eight patients, four patients showed articular surface tears, three patients showed involvement of the bursal surface, and one patient showed intrasubstance tear. Similar results were found by McMonagle and Vinson, who reported that articular-sided tears are by far the most common, involving the tendon fibers adjacent to the humeral head. The most common finding of tendinopathy was bulky hyperintense tendon without retraction of fibers seen in five out of seven patients with tendinopathy. Loss of the peribursal fat plane was seen in 10 patients, and all these patients had rotator cuff tears or tendinopathy. Concave subdeltoid fat contour was noted in 4 (10%) patients, which is due to herniation of the overlying muscle through the medium and large tears. 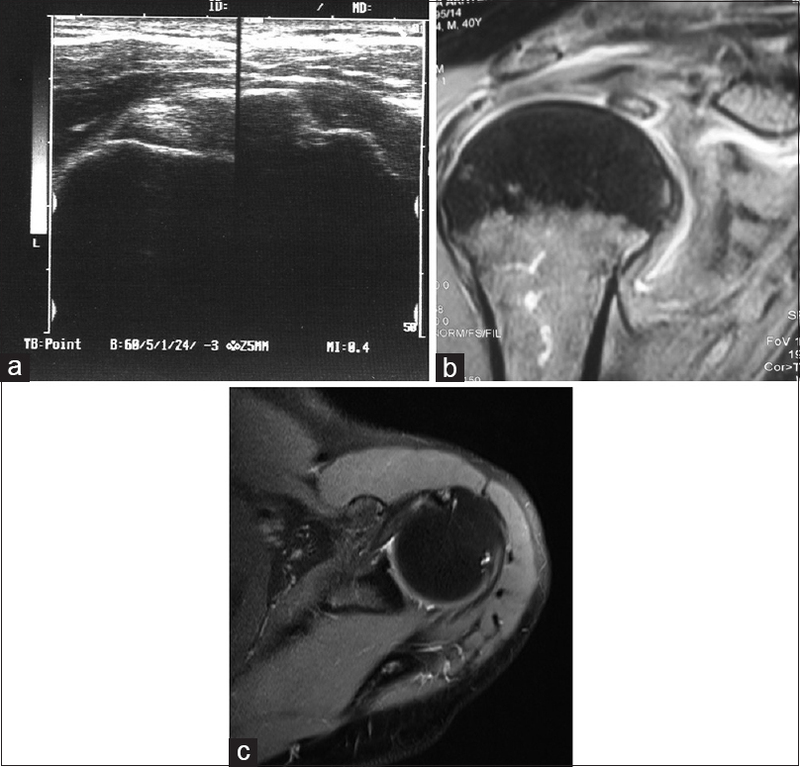 In 26 (65%) cases, biceps tendon sheath effusion was seen on USG examination, while on MRI, 27 (67.5%) cases of biceps tendon sheath effusion were seen. Thus, USG and MRI showed a high agreement for the detection of tendon sheath effusion. Similar results were reported by Alasaarela et al., who reported effusion of the biceps tendon sheath in 24 shoulders by MRI and in 20 by US and concluded a good agreement between USG and MRI for the detection of effusion of the biceps tendon sheath. Nonvisualization of the biceps tendon on the bicipital groove indicates either rupture or subluxation of the tendon. In our study of 40 patients, 2 (5%) patients demonstrated nonvisualized biceps tendon in the intertubercular sulcus. Out of these two patients, one patient demonstrated rupture of the biceps tendon and one patient had biceps tendon dislocation both on USG and MRI. On USG, biceps tendinopathy was seen in two patients, whereas MRI showed three cases of biceps tendinopathy. Out of 30 patients with rotator cuff lesions on USG, 14 patients showed FTTs and one patient with MRI-proven PTT was falsely diagnosed as having FTT. US also showed nine PTTs and one patient with MRI-proven FTT and tendinopathy each was falsely diagnosed as PTT. Out of seven patients with tendinopathy, one was normal and two had PTT on MRI. In total, US detected 29 true-positive rotator cuff lesions, three false negatives, and one false positive, while 7 patients were diagnosed as normal (true negative). When MRI was conducted on these patients, 32 patients had rotator cuff lesions while eight patients showed no tears and were diagnosed as normal. Out of 32 patients with lesions, 15 patients showed FTTs, 10 had PTTs, and seven had tendinopathy. The agreement between the two methods was assessed using kappa coefficient (kappa = 0.714). The strength of agreement between USG and MRI for the diagnosis of rotator cuff pathologies is good as per the calculated kappa coefficient. Similar results were obtained by Rutten et al. Statistical evaluation of USG for the detection of rotator cuff tears and tendinopathy compared with MRI was done. Sensitivity, specificity, and PPV and NPV were calculated according to formulae. US had high sensitivity, specificity, PPV and NPV, and accuracy. There are several advantages of USG over MRI. US is easily available, cheaper, and portable, has better patient compliance, and is less time-consuming. US is not subject to motion artifacts, it allows instant comparison with the contralateral side, and tendons and other structures can be evaluated dynamically. The real-time capacity of USG facilitates interventional procedures in or around the shoulder and allows better interaction with a patient who can point at the symptomatic area, which will optimize diagnostic yield. However, sonography of the shoulder joint is highly operator dependent. Small errors in transducer orientation and angulation may easily obscure small abnormalities within and around the cuff and give rise to false-positive and false-negative results. There is a steep learning curve for shoulder sonography. However, these potential pitfalls can be avoided by thoroughly understanding the normal anatomy, strictly insisting on proper transducer and patient position and using opposite shoulder for comparison. This can make sonography an effective, reliable, and noninvasive means of detecting rotator cuff tears and tendinopathies. A number of international studies have compared USG with arthrography, MRI, and arthroscopic findings and have proved US to be an effective, comparable diagnostic tool. The present study was based on high-resolution USG evaluation of rotator cuff pathologies and correlation of the findings with MRI was done in each case. USG and MRI are comparable modalities for the evaluation of rotator cuff pathologies. Evaluation of contralateral shoulder with USG should always be done for comparison. Haaga JR, Dogra VS, Forsting M, Gilkeson RC, Kwon Ha H, Sundaram M. CT and MRI of Whole Body. 5th ed. St Louis: Mosby, Elsevier; 2009. p. 2159-60. Yamamoto A, Takagishi K, Osawa T, Yanagawa T, Nakajima D, Shitara H, et al. Prevalence and risk factors of a rotator cuff tear in the general population. J Shoulder Elbow Surg 2010;19:116-20. Oh JH, Kim JY, Lee HK, Choi JA. Classification and clinical significance of acromial spur in rotator cuff tear: Heel-type spur and rotator cuff tear. Clin Orthop Relat Res 2010;468:1542-50. Mikolyzk DK, Wei AS, Tonino P, Marra G, Williams DA, Himes RD, et al. Effect of corticosteroids on the biomechanical strength of rat rotator cuff tendon. J Bone Joint Surg Am 2009;91:1172-80. McNally GE. Practical Musculoskeletal Ultrasound. China: Elsevier Limited; 2005. Dinnes J, Loveman E, McIntyre L, Waugh N. The effectiveness of diagnostic tests for the assessment of shoulder pain due to soft tissue disorders: A systematic review. Health Technol Assess 2003;7:iii, 1-166. Steinbach LS, Gunther SB. Magnetic resonance imaging of the rotator cuff. Semin Roentgenol 2000;35:200-16. Milgrom C, Schaffler M, Gilbert S, van Holsbeeck M. Rotator-cuff changes in asymptomatic adults. The effect of age, hand dominance and gender. J Bone Joint Surg Br 1995;77:296-8. Moosmayer S, Tariq R, Stiris MG, Smith HJ. MRI of symptomatic and asymptomatic full-thickness rotator cuff tears. A comparison of findings in 100 subjects. Acta Orthop 2010;81:361-6. Rutten MJ, Jager GJ, Blickman JG. From the RSNA refresher courses: US of the rotator cuff: Pitfalls, limitations, and artifacts. Radiographics 2006;26:589-604. Churchill RS, Fehringer EV, Dubinsky TJ, Matsen FA 3rd. Rotator cuff ultrasonography: Diagnostic capabilities. J Am Acad Orthop Surg 2004;12:6-11. Teefey SA, Rubin DA, Middleton WD, Hildebolt CF, Leibold RA, Yamaguchi K, et al. Detection and quantification of rotator cuff tears. Comparison of ultrasonographic, magnetic resonance imaging, and arthroscopic findings in seventy-one consecutive cases. J Bone Joint Surg Am 2004;86-A:708-16. Yamakawa S, Hashizume H, Ichikawa N, Itadera E, Inoue H. Comparative studies of MRI and operative findings in rotator cuff tear. Acta Med Okayama 2001;55:261-8. Farley TE, Neumann CH, Steinbach LS, Jahnke AJ, Petersen SS. Full-thickness tears of the rotator cuff of the shoulder: Diagnosis with MR imaging. AJR Am J Roentgenol 1992;158:347-51. McMonagle JS, Vinson EN. MRI of the shoulder: Rotator cuff. Appl Radiol 2012;41:20-7. Alasaarela E, Takalo R, Tervonen O, Hakala M, Suramo I. Sonography and MRI in the evaluation of painful arthritic shoulder. Br J Rheumatol 1997;36:996-1000. Zlatkin MB, Hoffman C, Shellock FG. Assessment of the rotator cuff and glenoid labrum using an extremity MR system: MR results compared to surgical findings from a multi-center study. J Magn Reson Imaging 2004;19:623-31. Kenn W, Hufnagel P, Müller T, Gohlke F, Böhm D, Kellner M, et al. Arthrography, ultrasound and MRI in rotator cuff lesions: A comparison of methods in partial lesions and small complete ruptures. Rofo 2000;172:260-6. Łach W, Dudarenko G, Brzosko M, Cyryłowski L, Fliciński J. Usefulness of ultrasonographic and MR imaging in diagnosis of shoulder impairment. Chir Narzadow Ruchu Ortop Pol 2003;68:307-11. Middleton WD, Reinus WR, Totty WG, Melson CL, Murphy WA. Ultrasonographic evaluation of the rotator cuff and biceps tendon. J Bone Joint Surg Am 1986;68:440-50.